This is for anyone who wants to read more about the French Bread from yesterday’s post. 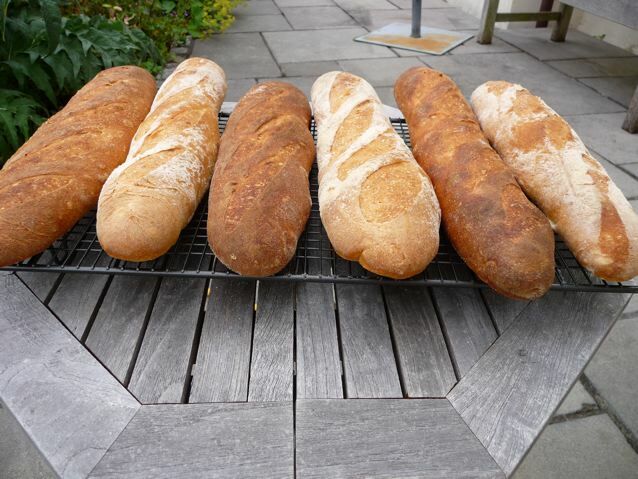 July’s breads for Mellow Bakers: French Bread, Bialys and a 70 % rye sourdough – all from Bread by Jeffrey Hamelman. Jeffrey Hamelman’s French Bread is a dough made with 70 % water to 100% flour, 2% salt and a little yeast: so quite a loose dough but not wildly wet like a ciabatta. It’s what is called a straight dough. No poolish, no pre-ferment, nothing. So this was a good opportunity to review a basic bread dough and practise the dreaded shaping. If you want to have a go at these, just follow a basic dough recipe, watch the shaping video, heat your oven up really hot, dig out a good sharp knife to do the slashes with and give it a go. If you make the dough with a little less water, say 65 % water to 100 % flour you will find the dough easier to shape. I use less yeast than in the book, 1/2 tsp per 450 grams of flour, because while it has been so hot lately the bread has been rising super quick and I wanted to keep to a longer rise in order to give the flour a chance to ferment a bit and develop some flavour. How to make it a bit more interesting while following the recipe? I decided to make two half batches of this dough using two different flours and try to keep the rest of the process the same. This was my attempt at being scientific and methodical, not something that comes particularly naturally to me. I made one lot with Waitrose Organic Strong White flour, my usual bread flour and the other lot with organic 00 Italian flour. In theory, the 00 should give you a thinner and crisper crust. or so I have read, plus it is lower in protein and feels finer so the bread should be different…. What a difference a drop of 10 degrees makes! I mixed both lots of dough in a stand mixer for the same periods of time. There was a time lag of about 10 minutes as I mixed one lot straight after the other. Bulk prove of 3 hours, with two folds. At the end of that time, I shaped the dough into rounds, went upstairs and watched the baguette shaping video by Ciril Hitz on Mellow Bakers again…. think I got the idea…..came downstairs and had a go. The point of the pre-shaping is made clear in the video and every time I skip doing it, I regret it. This time I did my best to play along though. Constrained like a lot of home bakers by the size of the oven, I divided each lot of dough into three portions, giving me approx 250 grams each and aimed for a length of about 14 inches on the baguettes. You could call them mini bags. So I did my best impersonation of Ciril Hitz, got a bit better by the time I got to the last one, isn’t that always the way? Then I put them in a couche cloth for a final prove of an hour and a half. I noticed that Ciril’s way gave me better, more rounded ends, not the little nose drip ends I often create. Heated oven up with the kiln shelf in up to 240 C on top bottom heat. Little iron tray on shelf below for the boiling water to go in to create a bit of steam. 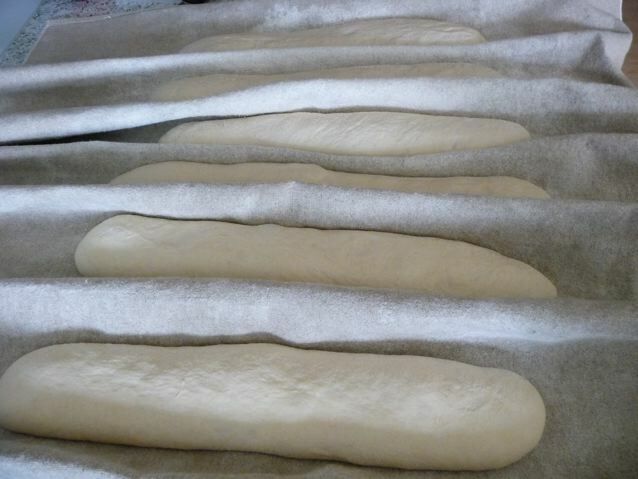 All going reasonably well, baguettes rising nicely, actually they don’t look too bad at this point…. …popped them in the oven anyway and baked them super hot with steam for about 22 minutes. Those are the darker ones made with the regular flour. I liked the colour of these ones best. Then into the oven with the second lot the oven was a bit cooler, maybe 10 degrees or so – they came out a little paler, was this due to the flour type, the bit of protective flour on the top, who knows? I take my hat off to any one who can really only change one variable and leave everything else exactly the same when they are home baking, I sure can’t manage it. Anyway here they are – I liked the darker crusted ones colour wise, however the paler ones made with the 00 tasted a little sweeter and wheatier. What’ s interesting is how similar their insides look, not a whole lot of difference there in the look and texture of the crumb. This entry was posted in Bread, Mellow Bakers and tagged Bread, Ciril Hitz, French Bread, Jeffrey Hamelman Bread, Mellow Bakers, Susan Wild Yeast on 10/07/2010 by Joanna. Wow! You really took this one on with a vengeance! Well done. Beautiful loaves, and very informative post! Joanna, those baguettes looks great. Your scoring is also very well done. What an interesting comparison. They all look wonderful to me. I’m in awe of your baking skills Jo. I have edited out the swearing when the blade catches in the dough and tried to stay positive and serene (at least in this post), so I’ve managed to fool some of you at least. 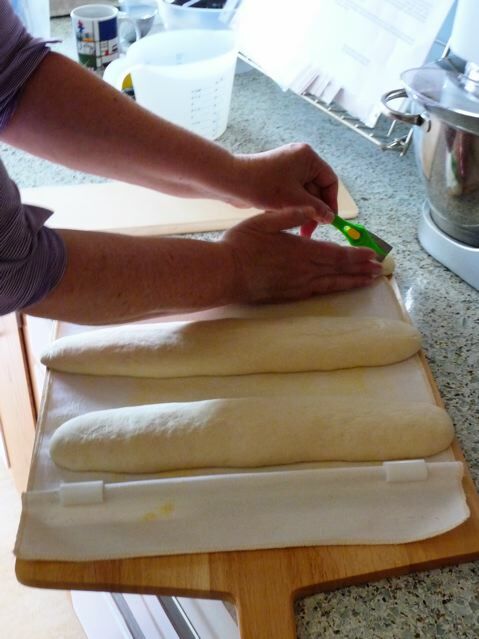 I wish I had a huge oven so I could make big full size baguettes – I sometimes wonder if that is what’s missing. I didn’t get ears this time, the tops of the dough simply wasn’t taut enough to open up properly. It’s very exciting when you do get ears though! Maybe next time …..
Jo, you’re a star. I wish I’d read this post and watched the video before I made baguettes yesterday. But I got so excited by your photos that I had to rush straight out and make some spelt ones. They tasted wonderful, but didn’t look nearly as pretty as your or Chef Hitz. They were scoffed at dinner with much enthusiasm, and the boys had the last one for lunch today, stuffed with Italian prosciutto. I can see how Susan spent two weeks making baggies – I always forget how much we like eating them. 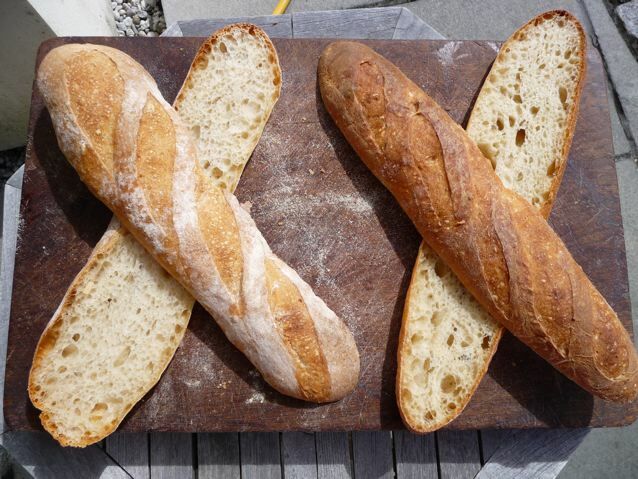 There are loads of ways to do baguettes, but this is a nice clear video isn’t it? Look forward to seeing some pics of your spelt babies, Celia! If you use a heavy duty linen ‘couche’ cloth (couche = sleep) then you don’t need a whole lot of flour on it, cotton teatowels are more sticky, because cotton has shorter, fluffier fibres as opposed to the long smooth fibres of linen or flax. Having said that I had to wash my cloth the other day and had a bit of a tussle getting it smooth and flat again, linen has to be not too wet and too dry in order to press it.. so it’s six of one and half a dozen of the other. If you have linen tea towels they will work better than cotton and need less flouring. Here’s a thread started by Jacqueline in Australia on Dan’s forum on the subject. Round ends, pointy ends all good :) I just don’t like the ones with the little bit sticking out, in fact Ciril Hitz had one of those in his film, so even he isn’t perfect! I think all of your baguettes look great, but I agree that I prefer darker crust. 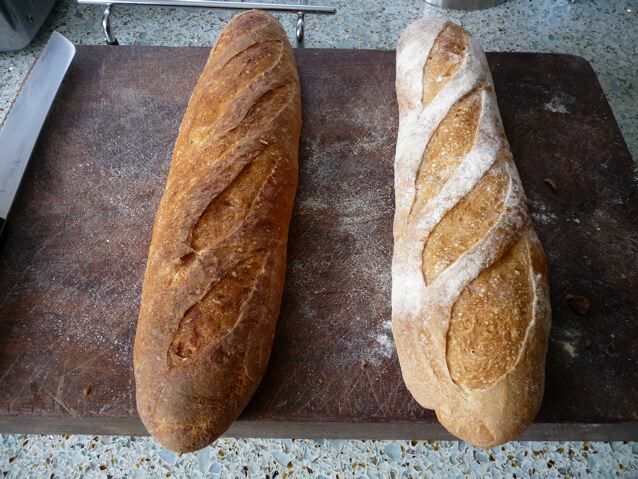 Maybe I should play around with flours too–I always have a hard time getting dark crust on French bread. Hoping I’ll have time this month to try this recipe, but not sure when yet. It might be your oven that doesn’t get hot enough Di. I am always torn between the cost of the electricity to get it super hot and my desire for dark crusts! The other thing to try, especially if the dough is having a long prove, is to give the yeast some extra sugar in some form, spraymalt powder (the stuff they use for beer is good for that and comes in pale as well as dark varieties), then I think the theory goes, if the yeast doesn’t eat all the available sugar, there is some left to do the Maillard reaction thingy and give you that nice ruddy brown colour on your crust . Now, the bit I liked about this was “I’m still at the having fun stage” – does this mean you might be thinking of going commercial? Really interesting and so impressive. I just love how easy the professionals make it look though…I can imagine me swearing a lot trying to replicate these..
No awe please :) What you need is a ‘flipping board’ Here is a picture of one sold by Bakery Bits, who I realise are a long way away, so if you are good at wood work, or can find something to substitute for one of these that is the answer to getting the long soggy ones from cloth to tray. Here also is link to very good video from Susan at WIld Yeast who is a brilliant baker. As she says ‘a narrow piece of stiff cardboard will do the trick’ Learnt a lot from her site :) She makes awesome baguettes !